Not too long ago I was privileged to be able to speak with speaker, author, and homeschooling mother Heidi St. John. Heidi spoke about making your marriage a priority even during the busy homeschool years. 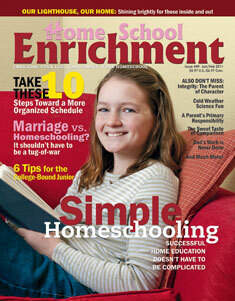 If you homeschool or know of someone who does be sure and check out the interview in Homeschool Enrichment’s Jan/Feb 2011 Issue or you can read it online. I love this Bible curriculum!